REDUCE your Lighting Costs: LED, Solar Lighting Tubes, LED Bulbs, LED Tubes, LED Spots, LED Floodlight, LED Street Light, LED Garden Lighting, LED Decorative Lighting and many more. Lighting accounts for 18 per cent of a typical household’s electricity bill. You can cut your lighting bill and energy use by changing which bulbs you use and how you use them. Houses typically use a mixture of standard light fittings and downlighters or spotlight fittings. Energy efficient bulbs are available for both types of fittings. Which light bulbs are energy efficient? 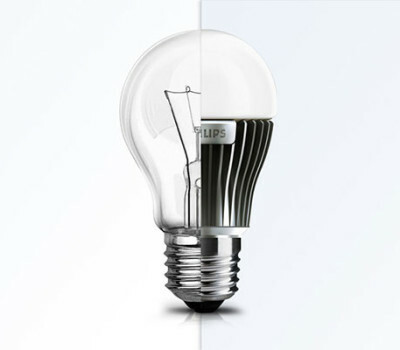 There are two main types of energy efficient light bulbs available in the EU and USA. Compact Fluorescent Lamps (CFLs) and Light Emitting Diodes (LEDs). CFLs are a cost-effective option for most general lighting requirements. Replacing a traditional light bulb with a CFL of the same brightness will save you about £5 ($6.50) per year, or £70 ($90) over the lifetime of the bulb. LEDs are available to fit both types of fittings and are particularly good for replacing spotlights and dimmable lights, they are more efficient than CFLs and will save you more money in the long term. By replacing all halogen downlighters in your home with LED alternatives, you could save about £35 ($45) a year on your electricity bills. What else can I do to save energy? You can save money and energy by implementing control mechanisms and being conscious of how you use your lighting. Always turn lights out when leaving a room, regardless of how long for. Be conscious of how many lights you have on and whether they all need to be in use. Arrange light switches so that its convenient to turn them off i.e. place switches at top and bottom of stairs, each end of a hallway and each door to a room. Use a sensor and timer on external lights so they are only in use when they need to be. Use appropriate lightings i.e. a low back ground light while watching television and a bright, concentrated light for reading. Having a range of lights in a room with separate switches will make this easier. Paint rooms a lighter colour to reflect the light so you need less lighting. Use daylight whenever possible, open curtains or blinds and turn off lights. If privacy is an issue, add net curtains. Dust light bulbs occasionally to increase light levels. YOUR LIGHTING COSTS PRICES - GO ENERGY EFFICIENT! YOUR UTILITY BILL IS NOT REAL - GO INDEPENDENT! GO ENERGY EFFICIENT!